Is there any finer afternoon activity than coming home after work, pouring a steaming hot bath, lighting a few candles and sprinkling in some bath oils, then relaxing with an absorbing book or by resting your eyes? The only way to improve on an hour like this is to step out of your beautiful porcelain tub into an interior designer's dream. Everyone fantasizes about the perfect home spa, so why not begin making over your bathroom into that imagined ideal? If you're considering taking the next step toward a spa bathroom, you'll want to consider a few tips along the way, from the right flooring to the ideal candles and necessary soundtrack. As you embark on your remodeling and redecorating project, keep a few of these essential tips in mind. 1. Find your style. 18th century French aristocratic elegance, Swiss mountain hot springs, Roman spas or Japanese bath houses - find an inspiration and you'll find a theme. 2. Settle on your materials. Let your bathroom's style inform your construction choices. From granite to porcelain or even hardwood, a bathroom can be constructed from a wide variety of materials. Don't fear splurging - it's worth it for your home spa. 3. Pick your vanity. While your toilet and bath or shower are the most essential features of your bathroom, they don't hold the eye-catching command or multi functional importance of your bathroom vanity. Yours should be an expert mix of efficient storage and glamour. 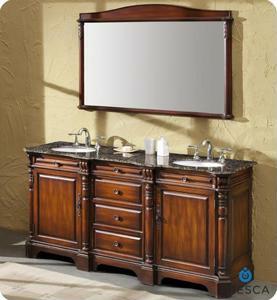 Let your vanity be the bathroom's focal point. 4. Begin establishing your décor. Informed in part by your established style and in part by its own themes, your décor will encapsulate wallpaper, colors, prints, mirrors, towel racks, doorknobs, shower curtains, ceiling and wall lighting fixtures, soap dishes, candle holders, plants and every other facet of your bathroom. Collect and establish these items slowly to let your home spa accumulate its own character. 5. Pay attention to lighting. Lighting may be one of the most important and overlooked parts of remodeling a bathroom as a home spa. Don't be afraid of large windows and natural light. At night and in the evenings, avoid harsh whites or fluorescents - anything too bright will mean discomfort, and that's the last thing any spa needs.